Barry Shiffman is the new artistic director of Rockport Music. Barry Shiffman learned an important lesson at the Tanglewood Music Center in the early 1990s. He had gone there with the St. Lawrence String Quartet, the promising ensemble he’d cofounded a few years earlier. They thought they were going to Tanglewood for an intensive study of the late Beethoven quartets. But when they got there, they learned that they’d also be working on a new piece with a composer, not well known at that point, named Osvaldo Golijov. They were initially resistant. Golijov’s piece wasn’t finished when they began rehearsing. And they didn’t understand the music, which seemed so different in sound than what was on the page. But they quickly grew into it, and the St. Lawrence String Quartet’s premiere of Golijov’s “Yiddishbbuk” was a critical event for both composer and ensemble, and the birth of an enduring relationship between them. Shiffman, who left the St. Lawrence in 2006 to turn his career toward arts administration, is the new artistic director of Rockport Music. 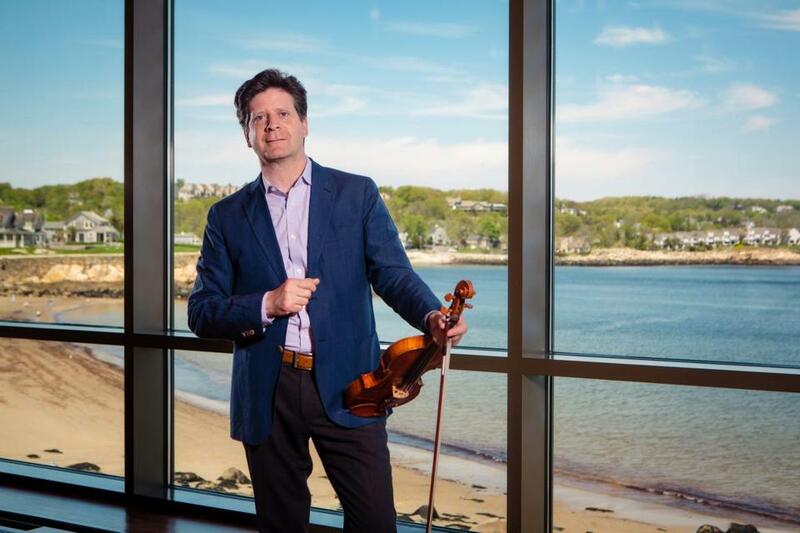 The first iteration of the organization’s flagship concert series, the Rockport Chamber Music Festival, under his direction is slated to open on June 15. Connections and associations from those days will be much in evidence. Golijov will be composer in residence at this year’s festival, whose opening night will include a newly staged performance of “Ayre,” the composer’s wizardly song cycle based on Jewish, Arabic, and Christian texts from the Andalusian region. It will be sung by the Lebanese-Canadian soprano Miriam Khalil. But it’s that spirit of being open to the unexpected that he hopes will animate this year’s festival. “Ayre” will share a program with a repertoire chestnut: Tchaikovsky’s string sextet “Souvenir de Florence.” (Shiffman, a violinist and violist, will perform in both pieces.) “How many people do you think are coming to hear ‘Ayre,’ how many people are really coming to hear Tchaikovsky?” Shiffman asked. Shiffman’s connections to Rockport itself go back to performances with the St. Lawrence in the festival’s former digs, the Rockport Art Association, which could become so stiflingly hot that audience members passed out more than once. Shiffman has seen the organization grow with the decision, spearheaded by former artistic director David Deveau, to build its own hall, the Shalin Liu Performance Center. Its importance, Shiffman said, cannot be overstated. But Shiffman also wants to get the festival outside the hall. So he’s planned a number of pop-up concerts at various sites in town. “You go to Brothers Brew to get a coffee in the morning, and I might be in the corner, playing the Bach Chaconne. Or there might be a string quartet. And then there is what Shiffman calls the “little bit of alchemy” that’s part of every artistic director’s job: knowing who would work well with whom in what repertoire. An example: pairing up cellist Colin Carr and the Emerson String Quartet for the first time to play Schubert’s String Quintet, which will close the festival. Listening to the excitement in Shiffman’s voice, though, one sensed that for him, the most exhilarating part of reinventing this annual gathering is wondering what fresh discoveries audiences will stumble on, almost by chance. He mentioned that he’d been talking up the festival during a recent cab ride from Logan Airport to Rockport. His driver asked how he’d know whether it was successful.